It is an annual national event reminding schools to confront anti-LGBT bullying and bias. Click here for more info from GLAAD. THIS Thursday, October 20, 2016. What happens? What can I do? Wear as many purple clothes as you can on Thursday, October 20th. The display of purple will show that you are against anti-LGBT discrimination and you support your LGBT students, faculty, and staff. Wearing purple will show you want to have a safe and inclusive school! What if I am a student and have a dress code or uniform? If you can’t wear a purple shirt or skirt/pants/dress, your school might allow you to wear a purple sweater, a ribbon pinned to your shirt, or a bracelet that is made of anything purple (ribbon, yarn, etc.). If you are comfortable, you could ask your parents for advice. Or, you can usually find your school’s dress code online if you Google your school’s name and “dress code” or “uniform.” If your school allows a non-uniform sweater and/or jewelry, wear them in purple! What about social media? What should I post? Spread the word! Share this page with your friends and teachers. 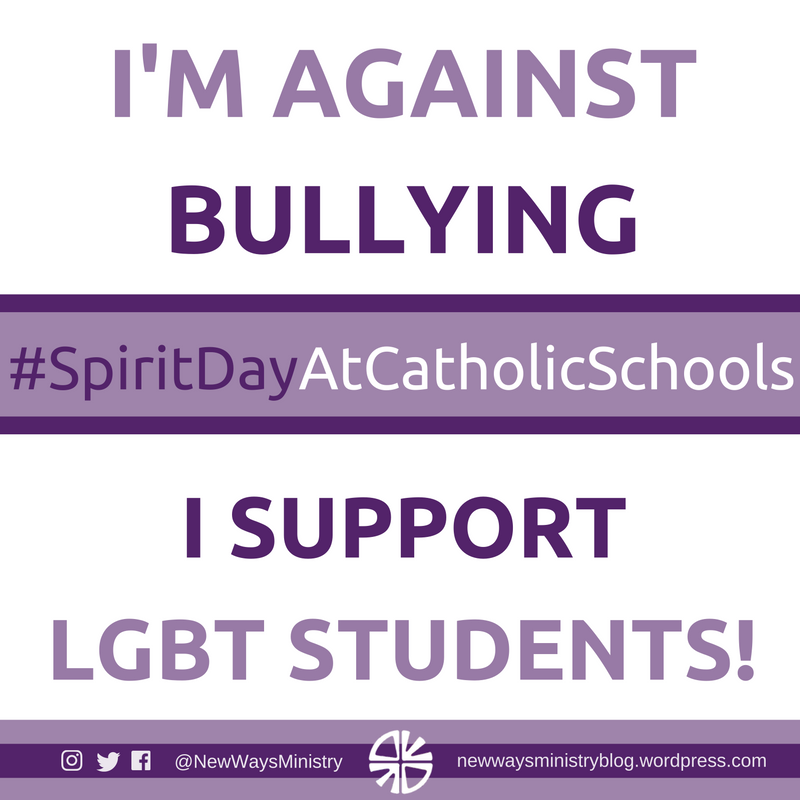 Use #SpiritDayAtCatholicSchools, @NewWaysMinistry and @GLAAD on all your social media posts and photos to join our new hashtag campaign. It will help you find fellow LGBT and ally students, faculty, and staff at Catholic schools while helping them find you! Share our social media banner (download here). Post our social media image (download here). Follow @NewWaysMinistry on Facebook, Twitter, and Instagram. Use GLAAD’s app (iPhone & Andriod) to make your profile pictures purple. We know we’ve said this a lot, but don’t forget to use #SpiritDayAtCatholicSchools for all your Spirit Day photos! This hashtag is new and making it go viral can bring attention to the work needed at Catholic schools. You can join this new social media trend! Want to find out more? Need help explaining Spirit Day to others or to your school? Wondering about the Catholic school context? Download and print this resource from New Ways Ministry explaining Spirit Day from a Catholic perspective! (PDF download available here). Click here for our original post calling Catholics to participate in Spirit Day 2016. Promote Justice for LGBT people, and their Allies.